The difference of two images of his own face on photographs and in the mirror, each explains differently. But so great is this difference which image should be considered their true face, everyone has to decide for himself. If you ask a professional photographer, optics, — the cause of the difference of the photographic portrait from the reflection in the mirror, you can listen to a lecture about the angles, the refraction image, the staging lights, etc. But perhaps the reason for this difference is deeper, as the photo and the reflection shows not only the appearance of the person but also his psychological state at the moment. The live image is always different from the pictures. The facial expression meets a lot of muscle, and change it every second. What is the mirror? It is, in fact, the theatre of one actor. Approaching the mirror, the person already knows what image he wants to see there. Wittingly or unwittingly, he adjusts his face under the desired expression. Random reflection can be unsuccessful any photos — this is worth remembering, passing the mirror Windows. Moreover, in the mirror the man sees himself continuously, as well as all fleeting, elusive changes. If you face something wrong, the brain immediately orders the muscles to change the position in accordance with a desired manner. The photo also captures a moment of life, and it is here that it all depends on the expressions in that moment. Moreover, not all poor photos — taken by a professional master portrait can exceed the beauty of a living person. A random photo at the wrong moment can ruin the most winning looks. But what man really is — depends on who and what eyes looking at him. "Beauty is in the eye of the beholder", it should not be forgotten. The focus should be on the mirror because others see people in continuous motion. Photo least reports the real situation. In front of the mirror to choose that expression which best suits the person and carry that person constantly. Photo may indicate the shortcomings of appearance, which you should get rid of. 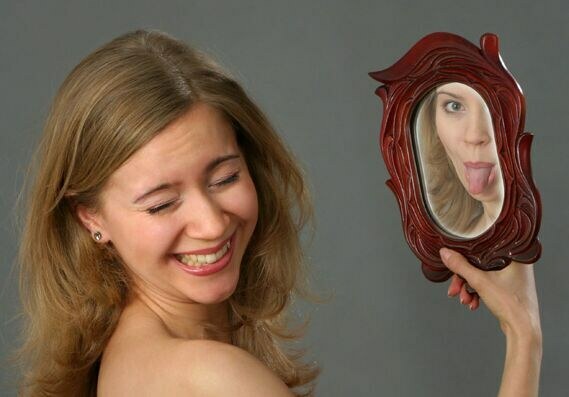 But the main thing — and the mirror and picture teaches people the same, namely to look at ourselves. If a person looks at himself a loving look, taking his picture, he starts to like and others. Most spoil of a man trying to hide himself, the habit of shrinking, sending into space a signal: "Yes, it looks bad, I don't have any decent photos, I get scared myself in the mirror, don't look at me, I myself don't like". Standing there before the mirror, posing to the photographer, showing yourself to others, remember that the main decoration of the person — positive Outlook on his surroundings and on himself. Then his own reflection or image will you always please.